Is your email list acquisition program too slow? If you’re going to ask consumers to divulge personal information in exchange for a special offer, the chances that your customers will participate go up dramatically if you fulfill your end of the bargain with haste. If you want to improve the likelihood that I’ll play ball, give me something simultaneous to my provision of data. That’s why this list acquisition program for Mexican restaurant chain El Torito misses the mark. 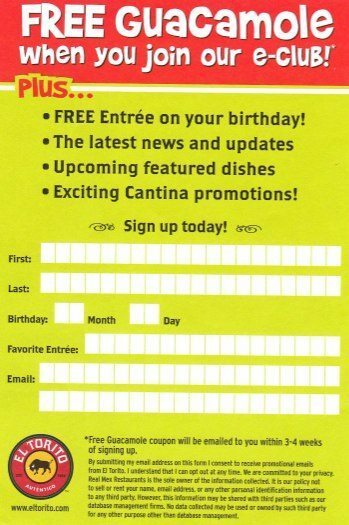 At each table in the restaurant (I was in a suburban Los Angeles location), the restaurant cleverly placed a large, bold form that shouted “Free Guacamole when you join our e-club.” As a lover of email marketing and guacamole (and not necessarily in that order), I was intrigued. Upon further review of the fine print, however, I discovered that a coupon for free guacamole would be emailed to me within 3-4 weeks. What? You can’t turn around an email coupon for a month? Zappos.com can get me shoes overnight, but El Torito can’t get me an email for 30 days? Failing that, if they are concerned about fraud leading to gallons of free guacamole give-aways (my assumption for the reason behind the 3-4 week delay), the restaurant could easily buy a single iphone or netbook computer and validate email addresses within 10 seconds. It’s great news that restaurants and other consumer-facing businesses want to build relationships with their customers via email. But, you have to make the value exchange meaningful and rapid for consumers to get involved.